Why do cats purr? 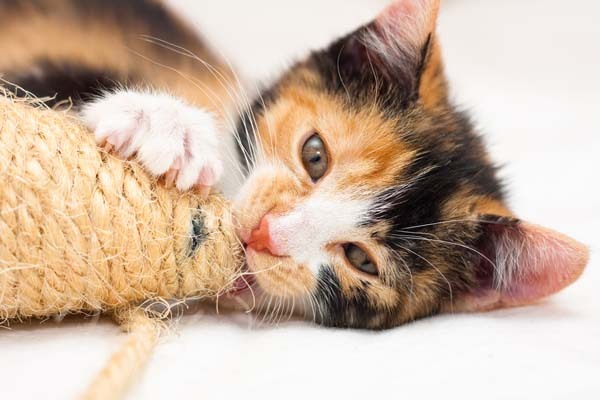 Let's look at how cats purr and find out why cat purring doesn't always mean a cat is content — it could signal something serious. Cats are evolutionary masterpieces of design. They have evolved in such a way that many of their characteristics, including behaviors, are multifunctional — helping to increase the odds of survival. Cat scratching marks territories, it communicates conflicted feelings and it maintains nail health. Cat whiskers feel wind directions, broadcast moods and help cats navigate. But what about cat purring? Why do cats purr and what does it mean when a cat purrs? Let’s find out. First, how do cats purr? Before we discuss why cats purr, let’s look at how cats purr. Photography ©kozorog | Thinkstock. Before we answer, “Why do cats purr?” let’s talk about how cats purr. There are a few theories about how cats purr. The one that stands up the strongest states that cat purrs are produced through a combination of the laryngeal and diaphragmatic muscles along with a neural oscillator. This theory makes sense, because when cats suffer from laryngeal paralysis, they cannot purr. A second theory claims that the small hyoid bone is responsible for cat purrs. The hyoid bone is located between the skull and the larynx. Another theory states that purrs initiate from the central nervous system. Purring is vital for the survival of newborn kittens. The little ones are welcomed into the world by the soft vibrations of their mom’s purr. They are born deaf and blind, but they do feel vibrations. These sweet vibrations are perfect homing devices, guiding newborns to the protective warmth of mom’s body and to their first meals. There is another way primal purring ups the odds for survival. Cat purring helps keep neonates safe from predators. Hungry predators are more likely to detect cries and other vocalizations than the vibrations of purrs. Cat moms purr when they give birth. 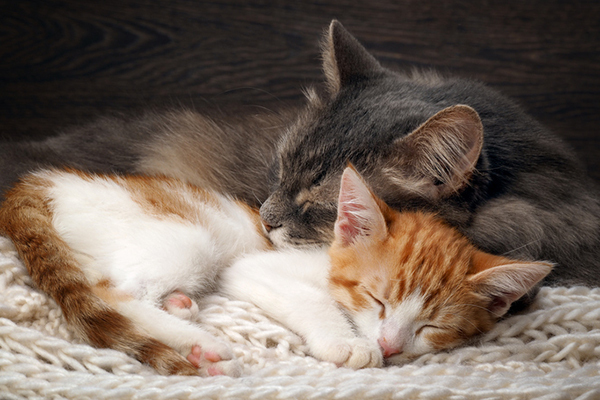 In addition to benefitting kittens, purring helps the mothers in a number of ways. The new moms are vulnerable and cannot defend themselves when they are giving birth. Painful cries attract danger. Instead of crying, they purr. 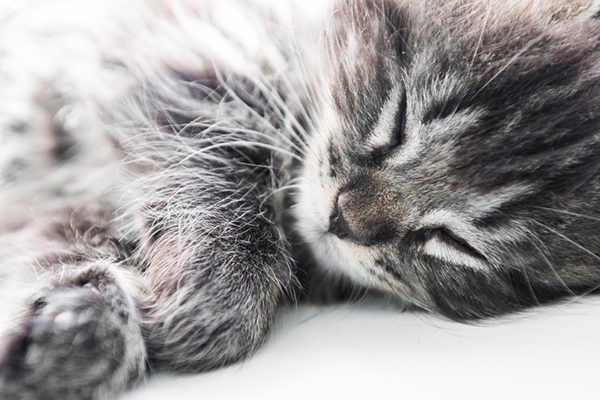 Purring releases endorphins, reducing pain while simultaneously reassuring the newborns without luring unwanted visitors. Another answer to, “Why do cats purr?” Cat parents are familiar with the relaxing purrs of cats as they cuddle and stroke them. These little purr machines exude contentment, with the added benefit of uplifting the moods of the people who adore them while lowering their blood pressure. Many kitties quickly figure out another basic benefit of purring — soliciting food and attention from their favorite people. Since most cat-parents lavish attention on their cats when they purr, cats often purr when they want affection and treats. Not all answers to, “Why do cats purr?” are as positive or obvious. Cats purr when they are stressed, in pain or severely ill. Often, cats at the end of life will purr. Cats enter life and leave life on a purr. What makes a purr a purr has tickled the curiosity of the scientific community for years. Studies find that purrs oscillate at a low frequency of 25 to 100 HZ. These frequencies promote bone healing and ease muscle pain. Clinical trials of people receiving ultrasound treatments have proven that low-frequency/intensity ultrasound accelerates healing in fractures. Purrs reassure and soothe, they promote healing and reduce pain. Another surprising answer to the question, “Why do cats purr?” Cat purring is actually a form of kitty exercise! 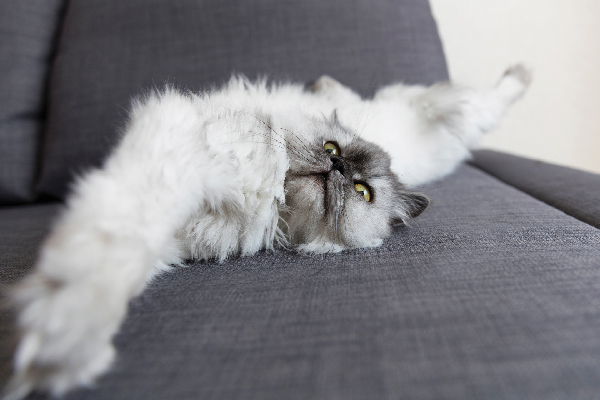 It is hard to imagine that relaxed, purring cats are in the midst of low-intensity exercise sessions. Felines are experts at conserving their energy through naps and lounging. 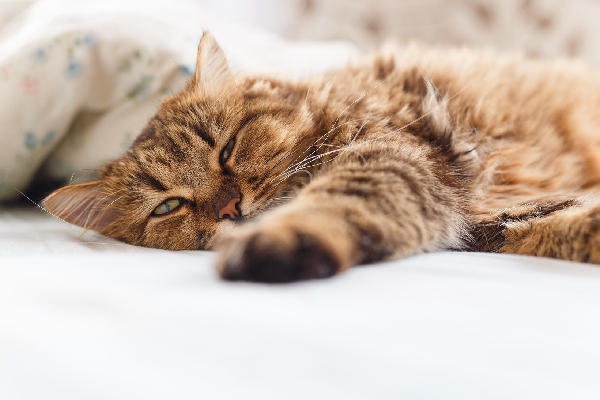 According to Dr. Leslie Lyons, world-renowned genetics researcher and professor at the University of Missouri College of Veterinary Medicine, the vibrations from purring may stimulate muscles and bones without the cat extending a lot of energy and effort. Something for you to think about the next time you cuddle with your little purr-machine. Looks are deceiving — in reality, she might be heavily engaged in calisthenics. Many other animals purr as well. The mechanisms that produce the purr vary between species, as do the meanings of their purrs. Gorillas, raccoons, rabbits, ring tailed lemurs, tapirs, elephants and hyenas are examples of other animals who purr. Cat purrs are complex and powerful. They comfort cats and their people. Their vibrations heal, produce pain-relieving endorphins and ensure the survival of newborn kittens. Thumbnail: Photography ©infinityyy | Thinkstock. She is also an award winning author. Her book Naughty No More! focuses on solving cat behavior problems through clicker training and other force-free methods. Marilyn is big on education — she feels it is important for cat parents to know the reasons behind their cat’s behaviors. She is a frequent guest on television and radio, answering cat behavior questions and helping people understand their cats. Has anyone ever had a cat purr with its mouth open / semi-open? Our Callie purrs with her mouth slightly to very open, depending on how happy she is. It is something I have never seen before. It also makes the purring louder. Hello and thank you for providing a comment section for important questions, I have one regarding a cat’s eye color. How come there are less eye color options for cats than there are for humans? For example, humans can have red or pink eyes due to albinism. I always wondered about this. My cat is a definite purrer (Is there such a word!). Great article interesting and informative. I have a rescue tortie/piebald who was born with splayed hind legs due to a glitch in her brain. She is not in any pain and thinks she is quite normal. However, because of cartilage deterioration in her oesophogeal area, she cannot purr. instead, when happy she squeaks, and makes a whistling, whiffling cosy sound in her throat. It is so endearing! But she is thereby denied the benefits of the self-soothing action of the purr. Is she missing out? I have a black male kitten around 4-5 months that I’m looking for a home as soon as possible. I was wanting to see if you would be willing to take him & find him a good home. after touring the exotic feline rescue center in centerpoint, indiana, we learned that lions roar and tigers purr. if a big cat roars, they can’t purr and vice versa. interesting fact. 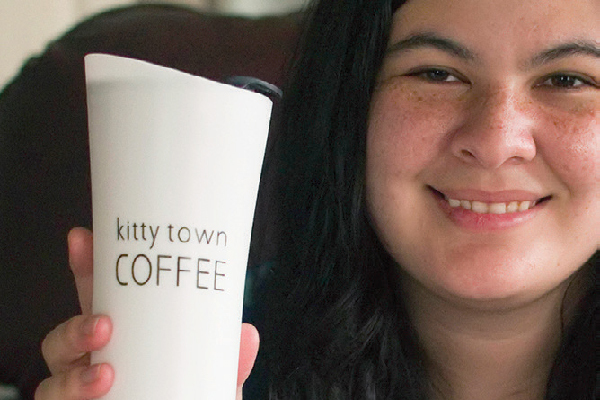 Hi Elisha, This article might have some good advice: http://www.catster.com/cat-behavior/stop-cats-fighting. We also suggest contacting a vet and behaviorist. Best of luck! Hi Janet — Thanks for reaching out! We suggest discussing this issue with your vet. Best of luck! How long do you stay away? I have two cats and we travel often. One of them hates a car ride. We leave our cats home alone for a week at time with plenty of dry food, water, and litter-robot. Little-robot is a lifesaver. It is worth every penny. I have the world’s best cat, but he seldom purrs. Sometimes I can feel him purr when I can’t hear it. He seems content and languishes in all the attention he gets. He’s extraordinarily handsome. Is something physically wrong with him? You can try some flower essences you put it in their food to help calm her down prior to the trip back buy a small crate/cage large enough to hold her comfortably and a small litter pan and comfy blanket. Cover the cage with another blanket to make a cave for her. You can put her in the cage prior to leaving you can even leave it set up in your house so she can sleep in it at home cats like places they can hid and feel safe. Cats do not do will with change all the time. So we have to make life as good as we can for them. Good luck.